Monday, March 18, 2013: It is with the greatest regret and deepest sadness that we have learned of the death of Michael J. Roarty, beloved former President of the Ireland-U.S. Council. He died Saturday March 16, 2013 in St. Louis, MO and was 84. He served as a distinguished leader of the organization for nine years from 1993 through the end of 2002 when he was Executive Vice President Marketing at Anheuser-Busch Companies. He succeeded Daniel P. Tully, Chairman & CEO of Merrill Lynch & Co., who had served as Council President for the previous four years. Mr. Roarty was an extremely-popular and well-known personality in international business circles and helped build Anheuser-Busch brands into international powerhouses. He was renowned as a public speaker for his wit, insight and command of language. The son of immigrants from Mayo and Donegal, he was born in Detroit, MI, in 1929. He was inducted into America’s prestigious Advertising Hall of Fame and served on the Taoiseach's Economic Advisory Board in the United States. 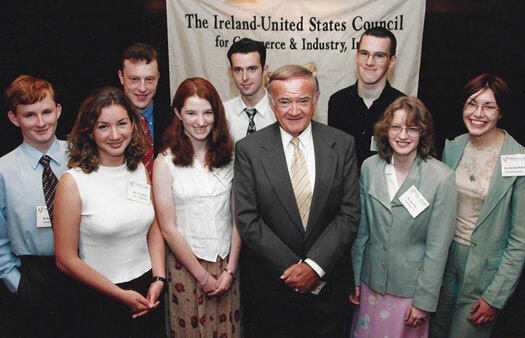 1999 Council Scholars at the Awards Lunch which was held at The 21 Club in New York. In his career at Anheuser-Busch, Mr. Roarty managed what many people believe was one of the most colorful, creative and effective marketing programs in world industry. During his tenure, Mr. Roarty helped Anheuser-Busch, America's largest brewer, in more than doubling annual sales volume of beer products, taking annual output from 35 million barrels in the 1980's to over 80 million barrels in the 1990's. During his tenure, the company's market share soared by more than 20 share points. During his tenure as President of the Ireland-U.S Council, membership support in the organization sustained strong growth, a viable and active Ireland Chapter was established and the Council’s range of program initiatives was significantly expanded under his enthusiastic guidance. Mike Roarty is survived by Lee, his wife of more than 58 years; a son, Sean Roarty, of St. Louis; a daughter, Mary Santiviago, of Washington, DC; and four grandchildren. The Ireland-U.S. Council is the premier transatlantic business organization that encourages and promotes business between Ireland and the United States. It was established in the Fall of 1962 by American and Irish business leaders in preparation for the visit of President John F. Kennedy to Ireland in the Spring of 1963, as a measure to build institutional form around a structure to improve business, economic and commercial relations between the two countries. The organization assists in the exchange of information, views and opinions between the two countries. Through its various membership activities, the Council provides a platform to meet and communicate for representatives from business, Government and other key policy makers from both sides of the Atlantic.